Here's What You Do: Apple's announcing a new iPhone. Guess what their stock is gonna do. Part 1. Apple's announcing a new iPhone. Guess what their stock is gonna do. Part 1. At Here's What You Do we recommend Apple products all the time. It's hard to get around that they are a market leader. Their laser focus on making their tools easy to use makes them that way. But their stuff can get mighty pricey. One way to get around the consumer blues when it comes to buying Apple, is to buy Apple. Stock that is. Let's a take a look. Something that seems strange about Apple stock on the surface is that it seems to drop whenever they make an announcement about a new product. We wondered just how reliable the post announcement drop is, and if we can profit from it. Some internet research will quickly yield you some charts to look at on the subject. Check out the one below from Eric Plat and Joe Weisenthal of Business Insider. The chart shows the 20 days before the announcement and 20 days after for major iPhone and iPad announcements over the past several years. All numbers in the chart are indexed to the price of the stock at market close on the day before the announcement. Business Insider investigates the pre- and post-unveil Apple Stock Prices. On the surface, it looks like there is a pretty uniform spread of reactions. The unveil of the original iPhone brought a large jump of almost 14%. The unveil of the iPad, on the other hand, brought a large 7% drop a fews days after the release. In fact, the thick black average line shows an uptick in price on the average. Looking more closely, however, we see something more reliable and more profitable. Five of the Seven unveils (iPhone 3G, iPhone 3GS, iPad, iPhone 4, and iPad2) all drop 5% within 11 days of the unveil. Some drop immediately. Some jump a little and then drop. The unveils that don't drop this far are iPhone and iPhone 4S. But, even one of these - the iPhone unveil - results in a drop in price to below pre-release levels about 16 days out. 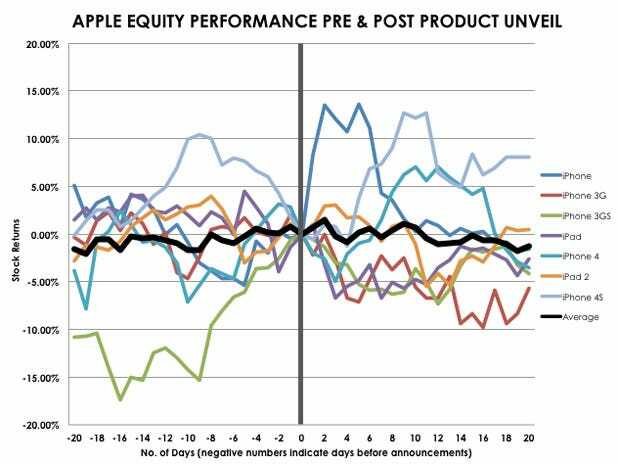 The bottom line here is that, even though we only are working with 7 data points, which is really not enough to make reliable conclusions, we can say that a majority of the time, we have seen a 5% drop in Apple stock after an unveil. If you consider that often Apple Stock is inflated on the day before the unveil, because folks have been anticipating the unveil for months ahead, it seems like the smart play is to 1) buy Apple many months out before an unveil, 2) sell the stock on the day before the unveil, and then 3) buy Apple again when the price has hit 5% below the your sell price in step 2. The end result is you profit from the built-up, avoid the loss in the unveil drop, and end up with Apple at deflated prices ready for the next leg up as the market adjusts to the reality of the newly unveiled product. 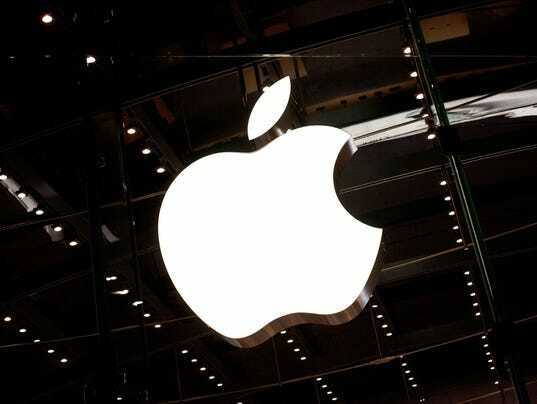 Apple is expected to unveil some products on September 10. Most likely, it is the new iPhone 5S, the next version of the iPhone line. Most folks are betting the iPhone 5C will also be unveiled. This is the low cost iPhone that will help Apple crack into the Chinese market. Along with this announcement might be an announcement that Apple has struck a deal with Chinese providers, and is ready to go with flooding the Chinese markets with 5Cs. This seems less likely. Finally, and very unlikely, is the announcement of the iWatch, a wearable iPhone that has been hyped for the last several years. At the close of Market on Sept. 9, the price of Apple was $506.17. It had risen steadily the past month from $454, all presumably due to the hype about the September unveil. If it does drop 5%, the target price to re-buy is around $481. We're going to watch the price and see what happens. Stay tuned for Part 2. Apple Stock Price leading up to the September 10, 2013 unveil.